After the 2011 London riots, large numbers of rioters were convicted and given much harsher sentences than for people convicted of the same kinds of crimes before the riots occurred. Did the tougher sentencing have a deterrent effect on crime? Laura Jaitman and Stephen Machin analyse the potential effect on crime of the severe sanctions that were enacted. Their results show a significant drop in crime; however, they also find that non-riot crimes actually went in the opposite direction, suggesting a rational response from criminals who look to have shifted from the types of crimes that received tougher sentences to those that did not. Does tougher sentencing deter crime? This is a fundamental policy question. In various guises, the question has been around a long time, with the notion in the economics of crime literature being that tougher sentences, and maybe sending more people to jail or prison, have scope to deter crime by individuals who would, in the presence of weaker sanctions, engage in crime. However, persuasive empirical evidence on the question is hard to find. This is, at least in part, because tougher sentencing does not usually arise randomly but occurs in response to crime increases that develop over time. For example, if criminal behaviour has been persistently rising over time and reaches a level that the criminal authorities deem to be too high then sentencing may get tougher. Evaluating the possible deterrence effects that may ensue then becomes difficult, because the sentencing change was determined by the prior trend in crime. In the paper “Crime Deterrence: Evidence from the London 2011 Riots” published in the Economic Journal May 2014 volume (and also co-authored by Brian Bell), we exploit the setting of the London 2011 riots and the criminal justice response to them so as to formulate an answer to this important question. In August 2011, London experienced some of the worst riots in its history. The riots took place in highly localized geographical areas, with crime going up by a huge 57 per cent in the affected neighbourhoods. The riots occurred in “hot spots” that were not experiencing differential rises in crime relative to non-riot areas prior to the riots happening. After these riots, large numbers of rioters were convicted and given much harsher sentences than for people convicted of the same kinds of crimes before the riots occurred. The subsequent harsh sentencing that ensued was not anticipated at the time (especially given the celerity with which the criminal justice system responded) and thus we think offers a credible setting to look for deterrence effects on crime in the post-riot time period. The London riots of August 2011 were unparalleled in terms of speed, scale and geographical spread. After a fatal shooting by police officers on August 4th, a peaceful protest turned into violent disorder that in the following days escalated and spread through other parts of England (to a number of the larger cities including Liverpool, Manchester and Birmingham). It is estimated that 13,000-15,000 people were involved in the riots, among them criminals, opportunists and spectators. During the 5 days of disorder, more than 5,000 crimes were committed (apart from the 5 fatalities, the offences were mainly burglary, criminal damage and violence against persons). These riot crimes took place in highly localized geographical areas; in only 1.8 percent of London sub-wards (smallest administrative unit) where crimes went up by a huge 57 per cent (from 19 crimes per 1,000 population to 22.7 crimes per 1,000 population) and did not rise at all in the other London areas. In the last days of the riots, the police changed the usual dispersal tactics employed in cases of disorders, making immediate arrests and the criminal justice worked intensively to deliver fast and tough sentences. 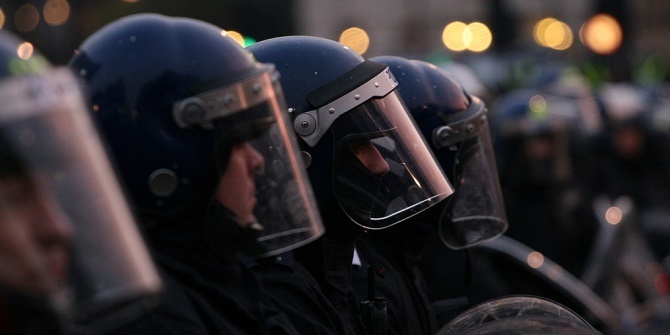 By September 2012 (a year after the riots) 4,600 people were arrested and 2,250 appeared before court for incidents related to the London riots. Among the causes of the riots, discontent with the police and stop and search practices that were perceived unfair were highly cited, as were social discontent, deprivation and lack of work or study amongst youngsters. In the paper we do not attempt to address the causes of the riots, we take the event as given and analyse the potential effect on crime of the severe sanctions that were enacted. We adopted a two stage approach for our research design: first, we tested whether rioters were indeed punished more than other criminals committing similar offences in a non-riot context; and second, we studied what happened to spatial crime patterns in the wake of the riots. We analysed Ministry of Justice data and found that rioters who were taken to court up to a year after the riots, were almost three times more likely to be placed into immediate custody than offenders with comparable demographic characteristics and that committed the same offences but in the previous year. In addition, rioters when convicted were sentenced to significantly longer sentences (approximately 2 months more on average than the 13 months received on average by similar offenders in the previous year). The severities of the sanctions for rioters were widely covered in the media and the perception of the population was that the sanctions imposed were tougher than expected. Did the tougher sentencing have a deterrent effect on crime? Our results show a significant drop in crime, both in riot and non-riot areas of London in the six months after the riots. On average we find a 0.25 percentage points decrease in the overall crime rate in non-riot areas after six months (3 per cent from its pre-riot average level). We observe a decline in crime even in London areas located far from the riot incidents (more than 3km away, or in the outer 5km of London excluding riot locations) and in Police Force Areas in England and Wales that were not affected by the riots. Moreover, we find that non-riot crimes actually went in the opposite direction increasing slightly. It suggests a rational response from criminals who look to have substituted away from the types of crimes that received tougher sentences to those that did not. This is consistent with the operation of a deterrence effect from tougher sentencing rather than only being the effect of incapacitation of criminals. We find little evidence that spatial crime displacement to other areas or extra police presence on the streets of London in the wake of the riots accounts for these patterns of change. The main mechanism that may have operated to prolong any deterrence effect of tougher sentencing is the perception of the prospective criminals that the change in the justice system was permanent and not transitory. The intense media coverage of the riot sentencing seems to be likely to have reinforced the belief of more severe sentencing still taking place. Our research exploits a natural experiment approach to study whether tougher sentences decrease crime. We use the exogenous, unexpected severity in sentences enacted in the London 2011 riots to analyze possible deterrence effects of tougher sentencing on crime. Tougher sentences seem to have a deterrence effect on crime. We also show that criminals tend to act strategically when deciding whether to get engaged in crimes or not, and also when choosing which type of offences to commit. Laura Jaitman – University College LondonLaura Jaitman is a PhD candidate at University College London, UK. Her main topics of interest are crime economics, political economy, and policy evaluation. She has recently joined the Inter-American Development Bank to develop the crime research agenda for Latin America and the Caribbean. Laura has a decade of working experience in a wide range of development programs in various Latin American countries. Stephen Machin is the Centre for Economic Performance’s research director, professor of economics at University College London and a member of the Low Pay Commission.